ELGIN, Ill. – There’s no question that a free-standing drill press is a shop asset when it comes to accurate drilling. Now to make that task even easier, the new JET 17 in. Drill Press features an innovative cross-point laser. Mounted to the head, the AC powered dual laser guide provides pinpoint accuracy with a visual indicator on where the bit enters the workpiece. The laser operates from its own on/off switch located on the power head. In addition to the laser, the drill press has its own work light to illuminate the work area. 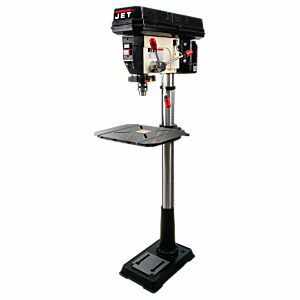 The multi-featured drill press features an extra-large 14 in. W x 18 in. L cast iron work table with two T-slots to accept jigs and other accessories. The table also has an integrated ledge that surrounds the tabletop to support clamping operations. A replaceable MDF center insert also is included with the table. Powered by a 9-amp, ¾-hp, single phase, 115-volt, TEFC motor, the free-standing drill press offers 16 speeds from 200 to 3620 rpm for drilling or sanding a variety of materials, including wood, fiberglass, PVC, and metals. The drill’s speed adjustments are made by lifting the motor housing cover and realigning the poly-v belt drive system. The spindle uses a Morse Taper #2. The spindle’s range of travel is 4-3/8 in., while its maximum distance to the tabletop is 29-1/8 in. The drill press has a swing range of 16-1/2 in. right- or left-handed operators. A 5/8-in. keyed chuck accepts both 5/8-in. shank bits and sanding drums. An adjustable tension depth stop rod sets up repetitive drilling. The JET JDP-17DX 17 in. Drill Press (Stk. #354173) is available at local distributors and through www.jettools.com.